Rick Church, Executive Director of CTDA, The Ceramic Tile Distributors Association, will be chairing the panel debate on the Globalization of the Ceramic Tile Quality which will take place at Qualicer 2020. Also participating on the panel are Federica Minozzi, CEO of group Iris Ceramica and Alfredo Peña, CEO of Graiman. QUALICER, the forum for ceramic tile, originated in 1990 when the Castellón Chamber of Commerce, Industry, and Navigation, and the College of Industrial Engineers joined hopeful expectations, efforts, and resources in creating an event exclusively dedicated to the ceramic tile sector, a watershed event in the history of such a dynamic and powerful sector, which has been the true engine driving the economy of this Mediterranean province. QUALICER was born as a modest forum for debate on tile as a product; it became a world congress on ceramic tile quality, and later not only addressed the quality of the process, the product, and tile installation, but also the quality of every element involved in the complex network of the ceramic business world. In the course of the years, QUALICER has matured and extended its frontiers, consolidating itself as a key international event for the world of ceramics. (ARLINGTON, VA—March 18, 2019) Coverings (coverings.com), the largest international tile & stone exhibition and conference in North America, will give back to the local community through a range of charitable initiatives at this year’s show in Orlando, Florida from April 9-12. Continuing its tradition of supporting the host city, Coverings will partner with both Clean the World and the Pet Alliance of Greater Orlando. For a second year, Coverings will continue its partnership with Clean the World, assembling and providing hygiene kits for veterans’ associations in the Orlando area. Participants, including the National Tile Contractors Association (NTCA), Tile of Spain, Ceramics of Italy and Coverings exhibitors Mapei and Florida Tile, will meet on Monday, April 8 for Coverings’ official service event, assembling kits onsite with daily items like toothpaste, shampoo, toothbrushes, lotion, Chapstick and more. The group hopes to double the output of last year’s initiative, with the aim of creating 1,600 kits for distribution to local veterans and will include handwritten notes within each kit as a thank you to those who have served their country. Coverings 2019 also marks a continuation of the show’s partnership with Habitat for Humanity. In collaboration with both Habitat for Humanity of Seminole County & Greater Apopka and Freeman – the general service contractor for the show – Coverings will donate tile and building materials to benefit Habitat for Humanity’s mission of building affordable homes for those in need. The three organizations will work together during show breakdown to identify and collect usable tile, stone and other products from exhibitor booths. Additionally, the Tile Council of North America (TCNA) and 21 of its members will continue their generous support for Orlando-area pets through TCNA’s tiled doghouse program at Coverings 2019. Showcasing tile’s versatility and style, participating members will design and build custom tiled doghouses. During the show these one-of-a-kind, handmade creations will be on display at the TCNA Art Tile Courtyard (Booth #4209), where attendees can see the craftsmanship firsthand and meet furry friends from the Pet Alliance of Greater Orlando. A donation ceremony will be held in the TCNA Art Tile Courtyard at 3:15 p.m. on Thursday, April 11th. Coverings returns to the Orange County Convention Center in Orlando April 9-12, showing the latest and greatest from over 1,100 exhibitors. For more information, and to register to attend, visit coverings.com. Coverings is the largest and most important ceramic tile and natural stone trade fair and expo in the United States. It features exhibitors from over 40 countries and is the stage for introducing some of the most innovative tile and stone products in the world. The exposition serves as a valuable resource for continuing education for all segments of the industry, with more than 45 informative, accredited seminars and live demonstration sessions throughout the show, all free of charge. Coverings attracts thousands of distributors, retailers, fabricators, contractors, specifies, architectural and design professionals, builders and real estate developers, as well as journalists and bloggers who cover this vital and dynamic industry. Sponsors of the show areThe Ceramic Tile Distributor Association (CTDA), Tile of Spain/Spanish Ceramic Tile Manufacturer’s Association (ASCER),Ceramics of Italy/Confindustria Ceramica,National Tile Contractors Association (NTCA) and theTile Council of North America (TCNA). The show is managed byTaffy Event Strategies, LLC. Coverings 2019 takes place April 9-12 at the Orange County Convention Center in Orlando, FL. For more information, visitcoverings.com or contact Taffy Events, Coverings Show Management, 703-539-5504. (Syracuse, NY – February 28, 2019) Jim Ambrose, best-selling author and a leading authority on wholesale distribution, has just launched a series of e-learning modules for branch managers that will enhance operations and lead to improved profitability. With more than 40 years’ experience in the wholesale distribution industry, Ambrose has expertly packaged the multi-module series to include essential business skills and time-tested leadership techniques for branch managers to be successful in this constantly evolving sector. The programs teach how to motivate and engage employees to increase their job satisfaction, while aligning the operation to maximize overall profitable share gain. Internationally recognized for providing a roadmap for success in the wholesale industry, Ambrose is making the e-learning workshop series available as digital content, for easy access anywhere with an internet connection. There are two featured workshops to choose from: the sales management focused Cracking Accounts: The Ultimate Toolkit for Sales and The Complete Jim Ambrose Masterclass, with sales techniques, financial analysis, management insights, leadership skills and employee engagement tactics. To learn more on this new e-learning offering, visit www.jimambroseworkshops.school. It is no secret that Arizona Tile founder, John Huarte, has strong and lasting ties with his alma mater. The shared legacy between John and the University of Notre Dame is one that is so profound, it can still be felt by many, years after the glorious revival of the 1964 Fighting Irish football team. Though his Heisman-winning battle to bring the University’s losing football team to victory has long been fought, his devotion to the University remains true. In November 2018, John along with his wife Eileen had the opportunity to give back to Notre Dame via a gracious donation of $1 million, intended to establish an endowment for grants in aid to student-athletes. Though generous, the gesture is a small way for a gracious graduate to give back to the school he loves most. Growing up in a sports-loving family on his father’s citrus farm, John’s appreciation for Notre Dame began at a mere 12 years of age. Listening to Notre Dame radio at the time only heightened his admiration for the University. When his older brother decided to enroll he decided that he too would follow suit. Once enrolled at the University, John joined the football team but did not see much playing time. However, upon completion of his first few years and more notably, as a member of the unsuccessful football team, John suffered an injury to his shoulder that would have likely cost him his entire football career. Had he opted for surgery, as was recommended by three different doctors, the fate of John and his beloved team would have most certainly been altered. During his senior year, however, at the recommendation of one more doctor and urged by first-year coach, Ara Parseghian, John decided against surgery, allowing his shoulder to rest instead. This decision bought him time to regain strength and return to the football field, hailing an endless flurry of victories thereafter. With the help of his strategically “mined” team, John and Ara led the Fighting Irish to an impressive 9-1 season. At a crossroads where the course of his life could have changed, John found unwavering support and sound advice. The ripple effect of such advice led him to win coveted awards, play on more than five professional football teams, and grow his most beloved prize to date: his family. Now more than 54 years later, the gracious alumni has found the opportunity to give back. 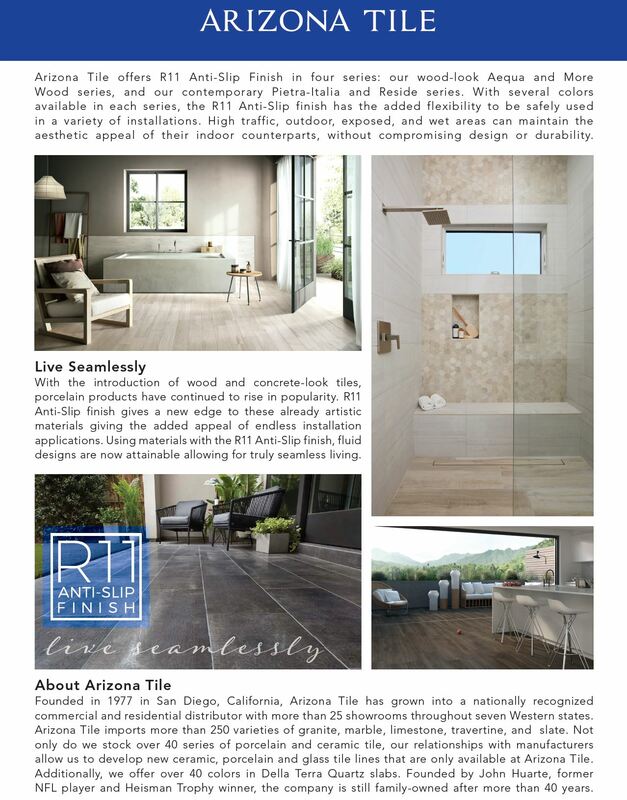 Founded in 1977 in San Diego, California, Arizona Tile has grown into a nationally recognized commercial and residential distributor with more than 25 showrooms throughout eight Western states. 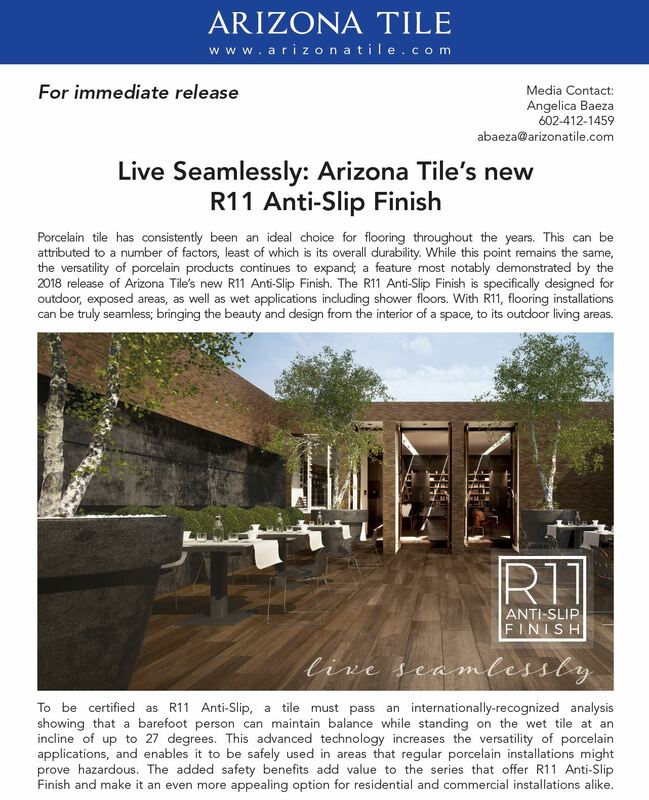 Arizona Tile is one of the largest independently-owned importers of stone in the United States, offering more than 230 varieties of granite, travertine, slate, marble, limestone and quartz, plus unique glass mosaics, porcelain tile and other design creations. Founded by John Huarte, former NFL player and Heisman Trophy winner, the company is still family-owned after more than 40 years. BALTIMORE, MD., January 7, 2019 – Fishman Flooring Solutions, a leading distributor of flooring and flooring installation products, will celebrate 100 years of continuous business success in the distribution industry in 2019. By way of contrast, successful companies today typically exist for approximately 15 years. The company, then known as L. Fishman & Son, first opened its doors in Baltimore in 1919 selling thread and sewing supplies to workrooms. Four years later, the fledgling company became a distributor for the American Thread Company. In 1960, the company began selling carpet installation supplies for the Roberts Company. Its work for Roberts became the foundation for Fishman’s current flooring business. The firm’s name was changed in 2012 to Fishman Flooring Solutions to better reflect the value the company brings to the marketplace. The following year, the company became 100 percent employee owned. Fishman has invested significant time over the past six months planning its centennial celebration, according to Wagner. Events to celebrate employees, customers, vendors and others have been scheduled throughout the year. Fishman Flooring Solutions, headquartered in Baltimore, Maryland, is the “Solutions Provider” distributor of flooring and flooring installation products. It has approximately 240 employees and 37 branches serving Delaware, Georgia, Indiana, Kentucky, Maryland, New Jersey, North Carolina, Ohio, Pennsylvania, South Carolina, Tennessee, Virginia, West Virginia and the District of Columbia. The firm, a division of L. Fishman & Son, Inc., distributes more than 36,000 products for approximately 75 vendor partners. For more information, please go to www.lfishman.com. © 2018 Ceramic Tile Distributors Association. All Rights Reserved. Doug Hayes named Vice President of Sales for Florida Tile, Inc.
Florida Tile has named Doug Hayes as Vice President of Sales. In his new role, Hayes will lead all the Independent, Branch, and Commercial Sales divisions for both the Florida Tile and Cotto d’Este USA Brands. 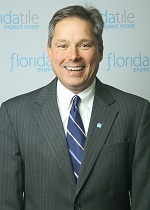 Prior to accepting this position, Hayes served as Florida Tile’s Director of Business Development and Commercial Sales. His tenure at the company spans nine years and includes a 2015 induction into the Ceramic Tile Distributor Association’s Hall of Fame. He currently serves on the CTDA Board of Directors. © 2017 Ceramic Tile Distributors Association. All Rights Reserved. Direct from Italy comes fine Italian Tile designed specifically for the North American market. headquarters at 4171, West Hillsboro Blvd, Suite #12, Coconut Creek, Florida. It’s one more step in Modomo’s goal to provide fine Italian tile, designed for the North American market. collective experience, providing the finest Italian tile to the North American market. merchandising and marketing, as well as, very favorable pricing.